Tame Impala's first album Innerspeaker is a great set of psychedelic songs and was one of the suprises of 2010. The band is mostly Kevin Parker's project. The versatile musician is the big mastermind. The great music he thought up found critical acclaim. So the anticipation was high when the new album Lonerism was announced. On the record the band is flying even higher and is exploring new ground. Not that it's shockingly different, but the band manages to improve on every aspect. They are digging deeper and adding more subtle aspects and layers. Think about The Beatles on Sgt. Pepper and add even more acid. I read somewhere that the album is kind of a trip in Parker's head. I wonder what the inside of his head looks like. It doesn't really matter, since what eventually comes out is simply brilliant. The music has the same sound as Innerspeaker. Lots of reverb, flangers and spacy sounds on top of seventies style drums. This also means it's full of jazzy grooves and rolling fills. 'Endors Toi' is a fine example of this. The synths in it remind me of the soundtrack of the movie Scarface: Al Pacino, his nose dipped in coke, pulls out "his little friend". Despite these associations Tame Impala have managed to cut loose from time and age. Although it reminds of past times, it could easily be music of the future. Yes, "timeless" would be a good word for it. First single 'Elephant' is a smart choice. It doesn't space out too much, has a great groove, is radio friendly, but still catches the whole album. I could pick out a few more songs and talk about them, but all songs on this album are simply top notch. An album like this would be called a masterpiece. And that's exactly what it is. Go buy and listen to it over and over and over again. Experience this brilliant trip yourself. Monday they are playing Paradiso Amsterdam but I didn't get tickets before it sold out. So if anyone has any left let me know! 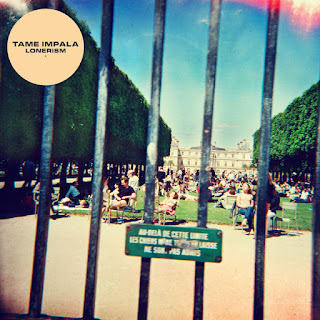 Listen to 'Lonerism' on Spotify.